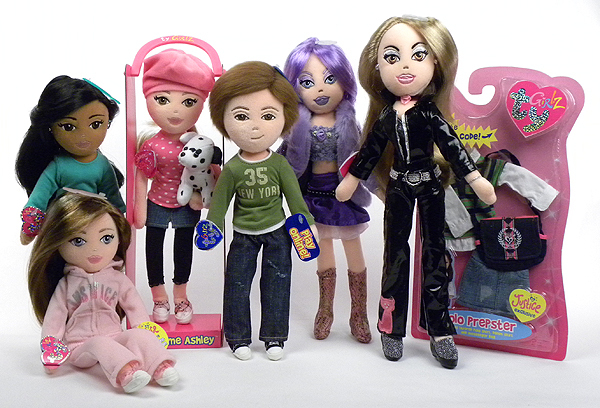 Ty Girlz made their North American debut at the American International Toy Fair in New York, on February 11, 2007. 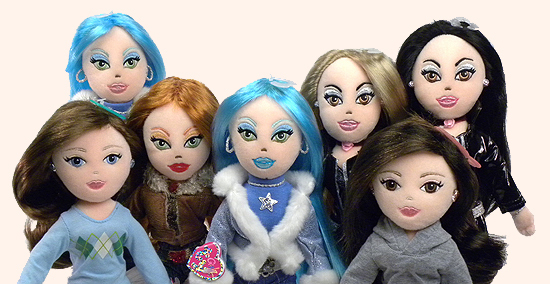 Each Ty Girlz doll came with a unique scratch-off code that gave the doll's owner access to the tygirlz.com Internet site (now discontinued). The original Ty Girlz were 14-inch soft-sculpt dolls dressed in trend-setting fashions that could be mixed and matched. Each Girlz outfit was complete with earrings, necklaces and bracelets. In subsequent years, Ty marketed additional outfits (generally referred to as Threadz) for the Girlz. The Girlz have soft, realistic hair that can be combed and styled. The Girlz are made by hand with fabric that feels skin soft. No plastics are used in the creation of Girlz. Wires were eventually added inside the Girlz, so they could be more easily posed. In February 2009, the first Ty Guyz doll, Totally Troy appeared on the scene. A male doll may not have been exactly what the toy market was waiting for. Ty did not release any new Ty Guyz after Totally Troy. Girlz introduced and produced after 2008 are not as tall as their predecessors, and their outfits are less intricate than the glitzy outfits worn by the original Girlz. The Girlz still appeal to younger children but there has not been a new Girlz doll produced since the third version of Justice exclusive Joyful Justice was released in 2010. At the end of 2017, Ty still listed some of the Ty Girz as "current" on the Ty official Internet site. Left to right above: Beautiful Briana, Sassy Star pink lips, Dazzlin' Destiny, Sassy Star blue lips, Rockin' Ruby blonde, Amazing Abbey and Rockin' Ruby black hair.